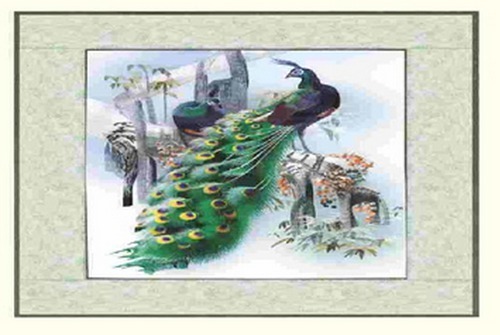 Our organization has come up with an extensive quality array of Peacock Landscape Painting. These paintings are designed using best quality array of raw materials and tools. These paintings are produced by our experts with the use of world class array of skills and materials. They have bright color and glassy looks. They are available with peacock images. These offered painting collections are highly appreciated for its perfect color combination and authentic designs. Our customers can avail these paintings at market leading rates. We, Picture Corner are leading Wholesaler, Trader, Supplier and Importer that established 1985 in Delhi . We are the biggest and most appreciated name in the market offering best quality collection of Cutting Machine, Pitch Machine, Lamination Machine and Photo Frames and Photo Frame Mouldings, Frame Cutting and Pinning Machine, Framing Machine , Lamination Machine,Bamboo Painting,Designer Painting, Modern Art Paintings ,Lamination Chemical Solutions, Photo Frame Hardware and Accessories, Photo Frames, Cold Lamination Film, Mount Paper and Printing Roller. These framing machines are created by our most creative and hard working set of team members. Our experts are brilliant and talented and most qualified in this realm. They use best quality machines and tools to create best array of machines for photography clubs. All these framing and laminating machines are modern and easy in functionality. These offered machines are available in many sizes and designs. They are elite and broadly appreciated for its quality body, easy installation, modern and easy functionality and very affordable prices.